Genealogy, like many fields, has its share of myths and misconceptions. A common misconception in eastern European genealogy is this: There is no hope of locating ancestral villages, much less ancestral homes, because so much was bombed, burned, and otherwise destroyed by the wars of the twentieth century. So why even try? Why try? Because maybe your village was one of the many that survived. And maybe you will find it identified in a map that is so detailed, every building in the village—including your ancestral home—will be represented by a small black square (or similar symbol). Finding such exquisitely detailed maps of eastern Europe takes some research. They are not likely to be filling the shelves of Barnes & Noble. In North America, they are more likely to be available through online retailers and societies that cater to the specific geographic areas in question. In Europe, bookstores and travel and tourism agencies offer more material than you can fit in your backpack. 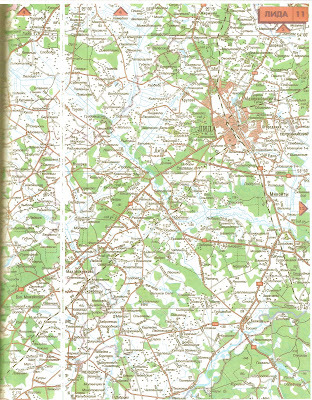 Belarus may not quite match its neighboring Poland or Lithuania in quantity of maps, but it holds its own in quality. 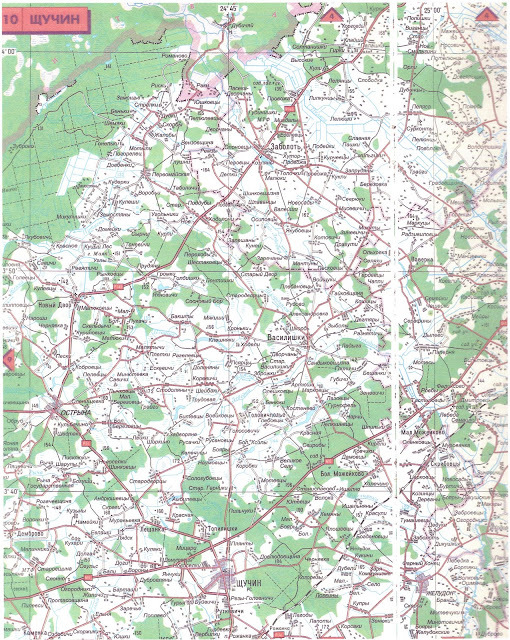 The very best maps I’ve seen for the Lida area of western Belarus are contained in a 23-map booklet of Hrodna (Grodno) oblast, or province, published in Minsk in 2002. The scale is 1:200,000 (1 cm: 2 km). 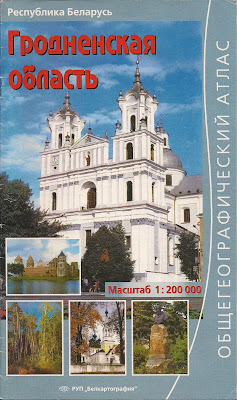 In that booklet, maps numbered 4, 10, and 11 cover the western Lida area that is my ancestral homeland. I am including those maps here. 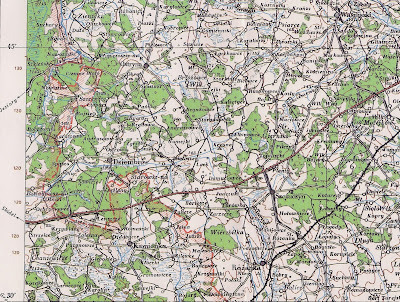 Map 10 displays the Szczuczyn (Scucin) area between Grodno and Lida. Map 11 shows the area to the east, including the city of Lida. Map 4 pictures the Radun area to the north, its lower edge straddling both Maps 10 and 11, and its upper half occupied by Lithuania and the border town of Eisiskes (Ejszyszki). 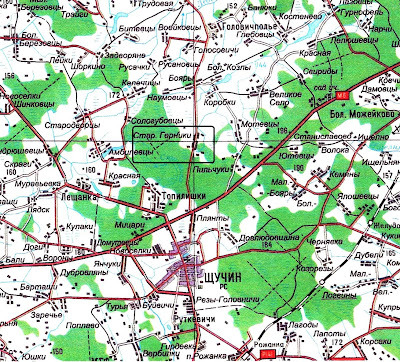 The maps are printed in Cyrillic Belarusian. They may frustrate viewers who don’t know the language. The reality, though, is that anyone researching this area needs to familiarize themselves with at least enough Cyrillic to know their village name—and even more important, their surname—when they see it. My babcia Stefania Ruscik grew up on the second farm on the left. When I visited the village in 2001, her older brother’s son was living in the fourth house on the left (where the black latitude and longitude lines cross on the map). As you look at these maps, look at how very many little black squares they display. If your babcia or dziadek came from the Lida area, your ancestral home may be here too. 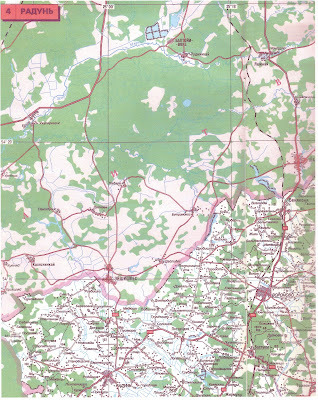 If maps printed in Cyrillic are a challenge to you, a vintage map in Polish can help orient you to the locations you seek. 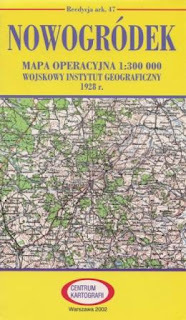 The Map Archive of Wojskowy Instytut Geograficzny 1919 – 1939 offers a wealth of maps from the interwar period when Poland’s eastern borders encompassed lands that are now in Belarus and Lithuania. Some of these maps are also available in hard copy, and may be purchased from Poland by Mail for about $10. The Nowogrodek map (#47) covers the Szczuczyn to Lida area; the Wilno map (#37) extends from Radun northward.